West Brom lost a three-goal lead against Tottenham as Christian Eriksen's injury-time goal left them three points clear of the drop zone. Matej Vydra volleyed West Brom ahead on 25 seconds before Chris Brunt doubled the lead with another volley. 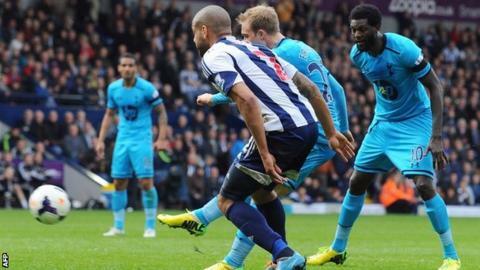 Tottenham's Emmanuel Adebayor had a penalty saved, before Stephane Sessegnon slotted in to make it 3-0. Jonas Olsson's own goal and Harry Kane's header were followed by Eriksen's top-corner leveller. It was the second successive home match in which West Brom have conceded an injury-time equaliser to deny manager Pepe Mel his first home win, and leaves them still in a fight for top-flight survival. Fulham's win over Norwich means the Baggies are just three points clear of the bottom three, while Spurs edged to within four points of fifth-placed Arsenal. West Brom appointed Mel as manager in January, following the sacking of Steve Clarke the previous month, with the club 14th in the Premier League and four points above the relegation zone. Despite just two wins under him - both on their travels - Mel's side have shown some fighting spirit in recent weeks, including a crucial win at Norwich last time out, and they again showed their character with a perfect start. Morgan Amalfitano worked his way past Danny Rose on the right, before sending in a dangerous low cross that was parried away partially by goalkeeper Hugo Lloris. The ball fell to Vydra, who volleyed home the opener. It got even worse for Spurs soon after as Brunt, making his first appearance for five weeks, volleyed into the net after Steven Reid's looping cross caused chaos in the box. Tottenham's hopes of qualifying for Europe had taken a battering in recent weeks, with three defeats in their previous four league matches, leaving manager Tim Sherwood facing an uncertain future. Sherwood had hoped Monday's 5-1 drubbing of Sunderland would spark a revival in fortunes but chances of a swift response were blown when Adebayor's low penalty was easily saved by Ben Foster, after Rose was upended by Amalfitano. The Tottenham boss had vowed to provide an attacking brand of football but it looked to be at the expense of their defensive duties as, after a miscued header by Younes Kaboul, Sessegnon raced clear of the hesitant Vlad Chiriches to slot past Lloris. The visitors pulled a goal back fortuitously before the break, when Olsson's block from Aaron Lennon's cross looped over Foster, and Spurs emerged a better side in the second half. Their pressure paid off when Kane headed in after brilliant wing play from Lennon, and they deservedly grabbed an equaliser when Eriksen cut inside to fire high into the net from inside the area in the dying seconds. "We had a good first half but the result has gone against us. "The problem is we are so keen to win the points, we need to play the same way regardless of being 3-0 up or if 0-0. "This is very difficult for me, the players are very down but we have five games to come. Every point is very important." "It was crazy. We might as well put 1-0 up on the scoreboard before we start. At 3-0, I thought we were going to win the game. We totally dominated. "They never had a shot on goal in the second half. Hugo [Lloris] was getting frostbite out there. "I thought our supporters got us back in the game. They never left us, they are knowledgeable and knew we were battering West Brom. "Expectations to be challenging for Champions League are too great. I am proud to be the manager of this great football club and long may it continue." Match ends, West Bromwich Albion 3, Tottenham Hotspur 3. Second Half ends, West Bromwich Albion 3, Tottenham Hotspur 3. Goal! West Bromwich Albion 3, Tottenham Hotspur 3. Christian Eriksen (Tottenham Hotspur) right footed shot from the centre of the box to the top right corner. Graham Dorrans (West Bromwich Albion) wins a free kick on the left wing. Substitution, Tottenham Hotspur. Andros Townsend replaces Danny Rose. Liam Ridgewell (West Bromwich Albion) is shown the yellow card for a bad foul. Foul by Liam Ridgewell (West Bromwich Albion). Attempt missed. Danny Rose (Tottenham Hotspur) left footed shot from the left side of the box is too high. Attempt blocked. Emmanuel Adebayor (Tottenham Hotspur) right footed shot from the centre of the box is blocked. Assisted by Younes Kaboul. Substitution, West Bromwich Albion. Craig Dawson replaces Jonas Olsson. Delay in match Jonas Olsson (West Bromwich Albion) because of an injury. Ezekiel Fryers (Tottenham Hotspur) wins a free kick in the attacking half. Offside, West Bromwich Albion. Liam Ridgewell tries a through ball, but Morgan Amalfitano is caught offside. Attempt missed. Christian Eriksen (Tottenham Hotspur) right footed shot from the centre of the box is high and wide to the right. Assisted by Emmanuel Adebayor with a headed pass. Substitution, West Bromwich Albion. Saido Berahino replaces Matej Vydra. Attempt blocked. Harry Kane (Tottenham Hotspur) right footed shot from outside the box is blocked. Assisted by Danny Rose with a headed pass. Goal! West Bromwich Albion 3, Tottenham Hotspur 2. Harry Kane (Tottenham Hotspur) header from the centre of the box to the bottom left corner. Assisted by Aaron Lennon with a cross. Attempt blocked. Harry Kane (Tottenham Hotspur) right footed shot from the centre of the box is blocked. Assisted by Kyle Naughton with a cross. Attempt blocked. Paulinho (Tottenham Hotspur) right footed shot from outside the box is blocked. Assisted by Emmanuel Adebayor. Foul by Younes Kaboul (Tottenham Hotspur). Steven Reid (West Bromwich Albion) is shown the yellow card for a bad foul. Foul by Steven Reid (West Bromwich Albion). Graham Dorrans (West Bromwich Albion) is shown the yellow card for a bad foul. Aaron Lennon (Tottenham Hotspur) wins a free kick in the defensive half. Foul by Graham Dorrans (West Bromwich Albion). Aaron Lennon (Tottenham Hotspur) wins a free kick in the attacking half. Offside, West Bromwich Albion. Liam Ridgewell tries a through ball, but Chris Brunt is caught offside. Substitution, West Bromwich Albion. Claudio Yacob replaces Stéphane Sessegnon because of an injury.